Botox injection for migraine does NOT hurt as much as the pain phase itself! That's just my experience, but have you been putting it off? Here are some important things you need to know before you consider this treatment. Botox is approved by the FDA and here in Australia to treat chronic migraines in adults (over 15 days per month). Botox is more famous for, or you might be more familiar with it as a quick wrinkle fix. It's been having great success rates and many patients are reporting significant improvements with Botox, as compared to other drugs that haven't worked. But, it's good to know what you are expecting from this prevention treatment. You may want a cure, but doctors aim for any reduction as a good sign the treatment is working. 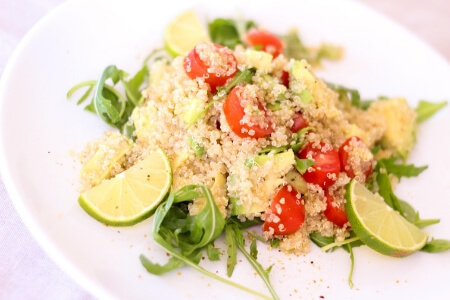 Fifty percent reduction is what they define as a successful treatment. This includes the decrease in the incidence, length of time the attack lasts, and the severity of your headaches. Fifty percent sounds good to me! The Biggest Question - Is It Safe? The question I get asked the most is whether botox injection for migraine is safe? The drooping eye is considered to be one of the more significant side effects to watch for with Botox injection for migraine. Just like any other medical treatment there is a lot to be considered. 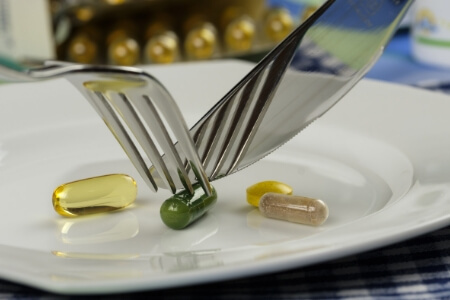 Both benefits and side effects have to be discussed and weighed up. It is important that you supply all your information to your doctor so you can both work together to decide if this treatment is right for you, and safe. In this CNN interview Dr. Binder says that Botox injection for migraine did not work in 15 – 20% of his patients, but the lady interviewed had not experienced another migraine in four years. That still sounds like good odds. Where Do They Inject It? Botox is injected directly into the muscles of and surrounding the eye area, nose, forehead, sides of the head and neck. 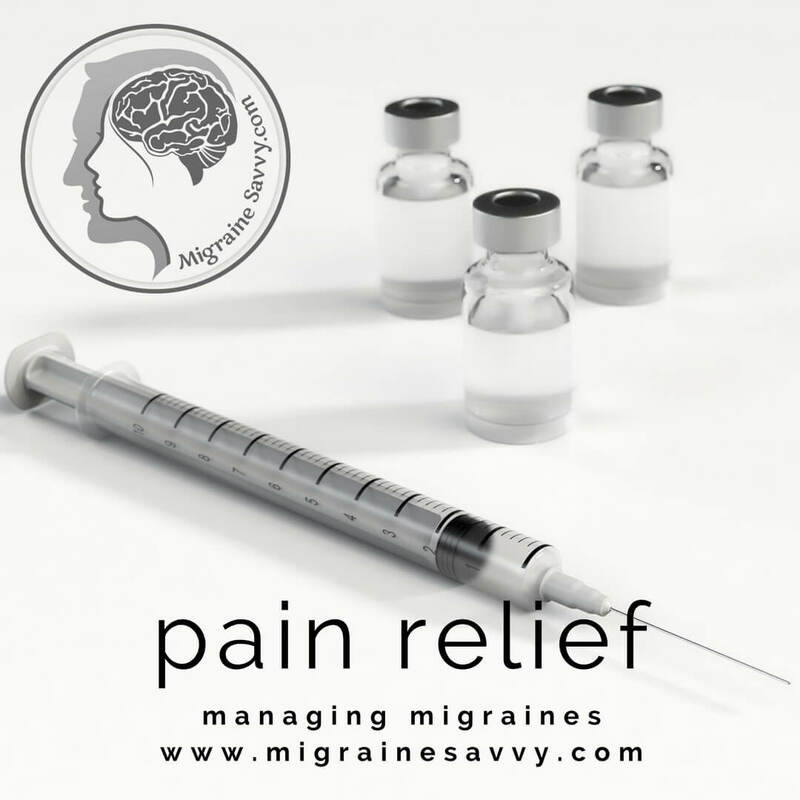 The injection sites considered are directly into the muscles where we migraine sufferers report pain during an acute migraine attack. Be sure to mention where your pain occurs just in case it's in a slightly different location. Botox can provide pain relief for months. Fixed site pattern – the most common muscles in the face and sides of the head receive the injection. Follow the pain site pattern – if the pain in association with the migraines is in the neck and right side of the head, then the muscles in the neck and head are the selected sites for injections. For complete effectiveness, a combination of the two injection techniques is often used. I was very surprised to learn that the efficacy of the Botox injection for migraine - a neurotoxin drug - often improves with additional treatments. What delightful news for migraine sufferers. Efficacy can improve with each additional treatment. According to Emergency Medicine “each muscle is injected with between 2.5 and 5 units of the neurotoxin, resulting in a total of 18 to 24 separate injections”. They also say that doses of up to 100 units are used and that this procedure needs to be repeated every three to four months. My neurologist just said he uses 500 units, so check with your MD. According to the FDA approved labeling text under section 17.3 Medication Guide – Botox and Botox Cosmetic (onabotulinumtoxinA) for injection may cause serious life threatening side effects. Problems or symptoms to watch for after treatment can include: difficulty “swallowing, speaking and breathing”. 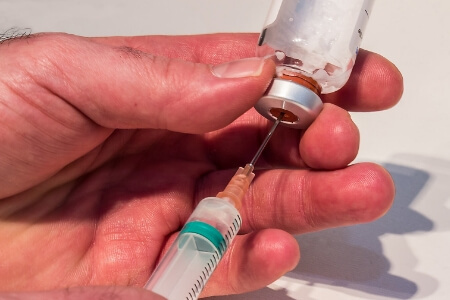 The "problems can happen hours to weeks after an injection" and lead to death if complication develops with your breathing muscles becoming too weak to function normally. Even though the FDA says it has no "confirmed serious" cases of the spread of the toxin to other parts of the body when Botox has been used at the recommended dose for treatments, they still make a special note of the symptoms to watch for. They say that the spread of toxins away from the injection site may create these symptoms: overall body muscle weakness, double or blurred vision, drooping eyelids, loss of voice, trouble speaking, loss of bladder control, trouble breathing and trouble swallowing. And what about food poisoning... isn’t that what botulism is? Botox injection for migraine can also cause flu like symptoms as side effects. 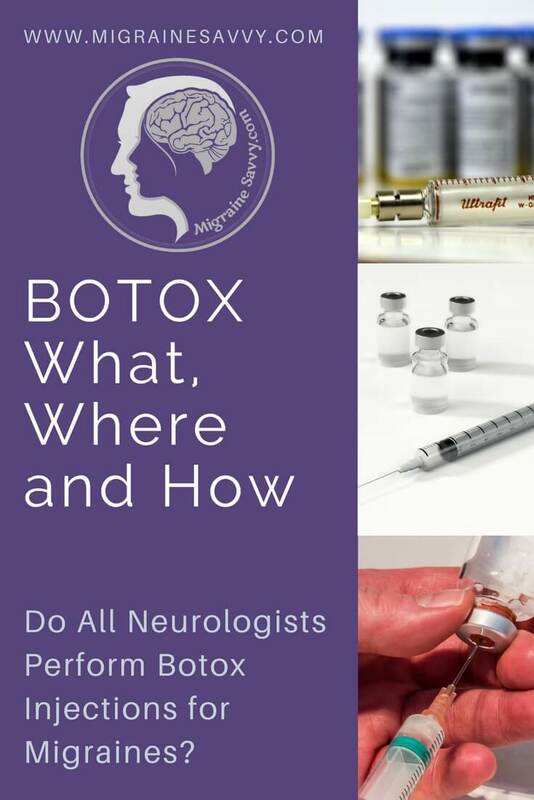 Do All Neurologists Perform Botox Injection for Migraine? Find out first to save time and money! No. Not all neurologists deal with migraines. In Australia you need a GP's referral letter to see a neurologist that performs botulinum toxin injections. If you can find one that specializes in Botox for migraine headaches. It took me four years and it wasn't until I was crying and almost screaming in desperation at my GP's office that I finally got a referral to Dr. Ng. True story! Don't let yourself get to that point, because there are often long waiting lists to see specialists. In Sydney, there are very few doctors who specialize in Botox injection for migraines. 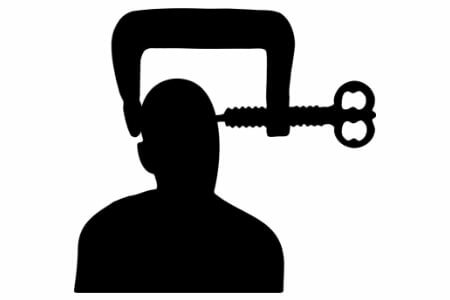 It seems kind of crazy - in a city with 4 million people that there are only a handful of doctors who treat migraines. I'm confident that will change. Luckily Dr. Karl Ng is quite experienced in the use of botulinum toxin injections for medical disorders such as migraine. If you live in Sydney, Australia here are the details for Dr. Karl Ng, along with the Headache Impact Test (HIT-6) he uses. It is useful to fill this little form out before seeing him to monitor your future progress. "My usual criterion for injections are those who have tried other therapies and have the following features to their migraine, as set out in the Therapeutic Goods and Administration (TGA): Headache occurring 15 days, or more, of the month, and where at least 8 of these are migrainous in nature." Dr. Ng has also written a number of articles. 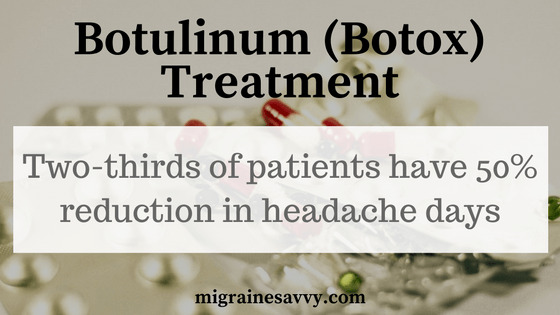 This one on botulinum toxin treatment and injections is about its use in neurological disorders. Neurologist - Director Neurophysiology, Senior Staff Specialist, Royal North Shore Hospital. How Can You Prevent Migraines? Keeping regular routines and staying hydrated, also help. A great thing to do before and during an acute attack can be to listen to guided meditation CDs or MP3s. This should help reduce pre migraine anxiety and help you relax and drift off to sleep. I've recorded a few meditation audios in my migraine pain management course. It's free to enroll, so click here and check out the curriculum. 1. Webmd.com (2014) Botulinum Toxin (Botox) Treatment Overview. Available at: http://www.webmd.com/beauty/botox/botulinum-toxin-botox Accessed May 22, 2017. 2. Emergency Medicine (2011) Understanding Migraine: Strategies for Prevention. Available at: http://www.emedmag.com/html/pre/fea/features/101503.asp Accessed June 6, 2011. 3. The U.S. Food and Drug Administration (2016) Botox Medication Guide. Available at: http://www.fda.gov/downloads/Drugs/DrugSafety/UCM176360.pdf Accessed on May 22, 2017. 4. Dr. Karl Ng MBBS (Hons 1) FRCP FRACP CCT Clinical Neurophysiology (UK) Director of Neurophysiology at Royal North Shore Hospital and Consultant Neurologist and licensed botulinum toxin administrator at Sydney North Specialist Center. Discussions dated February 15, 2012 - Updated May 19, 2017.